moniquemeloche is thrilled to present Black White and Red All Over, Genevieve Gaignard’s first solo show with the gallery, and her first in Chicago. The exhibition will focus on the artist’s new body of mixed media works on panel and will include a new site-specific installation. Arising out of her well-known photographic and installation-based series, these new works convey a declaratively political angle through novel formal means. Gaignard explores issues of race, class, and femininity using an uncanny humor befitting these concepts’ duality as both weighty markers of identity and unfixed values traded fluidly in popular culture. As a biracial woman in America, Gaignard investigates the aesthetic and cultural divide between black and white, a chasm as palpable as it is “invisible.” As an artist interested in the varying incremental shades that exist between, and inadequately define, these markers, Gaignard’s practice hinges on composites: of identities, experiences, appearances, materials. Her staged photographs present a spectrum of imagined and wholly recognizable “selves,” demonstrative of the kaleidoscopic means by which our outward existences are forged and fashioned, and pointing to the imperfect relationship between our inner worlds and public lives. Her installations, composed of myriad materials and found objects dutifully collected by the artist from various sources, convey a similar multiplicity. Representing something more, and different, than the sum of their parts, these domestic tableaux meld the real and the imagined; they are a patchwork of cultural associations, evocatively familiar yet pleasurably strange. Genevieve’s newest body of work is, then, an amalgamation of these photo- and installation-based arms of her practice. Images culled from vintage issues of Ebony, Jet, and Life magazines (which her mother regularly collected when the artist was growing up) mix and mingle with found fabrics, vintage wallpaper, and the odd knick-knack. With a free hand and mind, the artist plays with these disparate elements until a narrative appears. This process facilitates unexpected, profound juxtapositions, and provides a liberated platform for her continued formal investigations. The resultant scenes – in turns whimsical, ironic, beautiful, nostalgic, and critical – serve to bolster and amplify the artist’s resounding political voice. Genevieve Gaignard (b. 1981, Orange, MA) received her BFA in Photography from Massachusetts College of Art and Design, Boston (2007), and her MFA in Photography from Yale University, New Haven (2014). She has had several solo exhibitions including Counterfeit Currency, The FLAG Art Foundation, New York (2018); Hidden Fences, Praz-Delavallade, Paris, France (2018); Prospect 4: The Lotus in Spite of the Swamp, curated by Trevor Schoonmaker, New Orleans (2017); In Passing, Houston Center for Photography, Houston (2017); The Powder Room, Shulamit Nazarian, Los Angeles (2017); Smell the Roses, California African American Museum, Los Angeles (2016), among others. 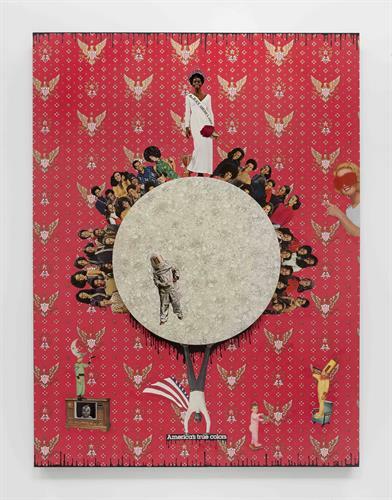 Her work has been included in numerous group exhibitions, including Personal Space, Crystal Bridges Museum of American Art, Bentonville, AK (2018); the Daegu Biennial, curated by Ami Barak, Daegu, South Korea (2018); Talisman in the Age of Difference, curated by Yinka Shonibare MBE; Stephen Friedman Gallery, London, UK (2018); and Fictions, The Studio Museum in Harlem (2017), among others. Select public collections include The Art Institute of Chicago; The Studio Museum in Harlem; California African American Museum, Los Angeles; Pérez Art Museum Miami; The Nasher Museum of Art, Durham, NC; The FLAG Art Foundation, New York; and the San Jose Museum of Art, CA. The artist lives and works in Los Angeles.